Although Czekaj’s cartoon is funny, it is also unfortunately somewhat accurate: “Doodle” contains interesting and varied work that pushes the limits of what counts as a cartoon, but suffers from a lack of clear curatorial direction. I was drawn in by individual artworks, but found myself confused as to what was their connecting thread. 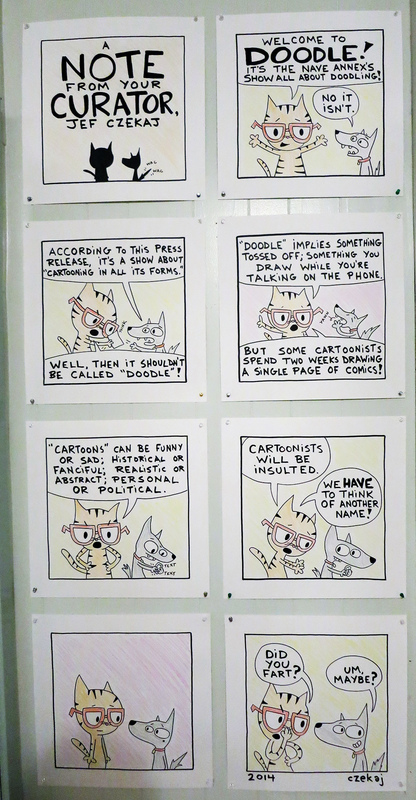 Some of the work looks at the mechanics of what makes up a cartoon, isolating panel structures, or focusing on line-work. I loved the freedom and humor of Fish McGill’s doodles harnessed into Cosby sweaters. 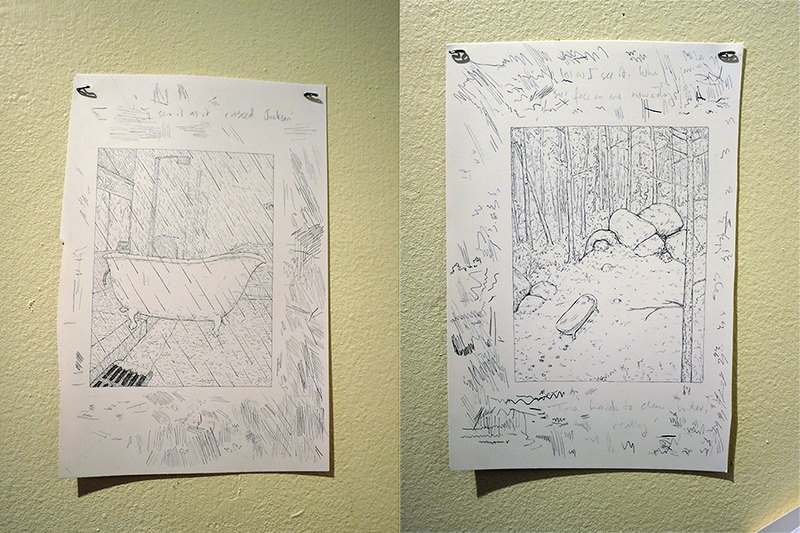 Jordan Stabile exhibits the original pages from his zine, “The Slip” (for sale at the gallery). The scratches and test lines in the margins become their own drawing, adding the texture of process to the sharply creative series of illustrations. Some pieces are lighthearted, like Liz Prince’s “How do you know where to draw the line? Library Notes.” The pieces of paper both reference and deconstruct the cartoon panel and her tightly packed accumulation of doodles invites the viewer to spend time investigating and pulling out a series of moments. Other pieces demand close attention from the viewer for more somber reasons, such as Maria Photinakis’ 3-page comic on the Boston Marathon Bombings. Photinakis and Abbott use the cartoon structure in a way that is more akin to a poem than to the traditional conception of straight panels and clear action. 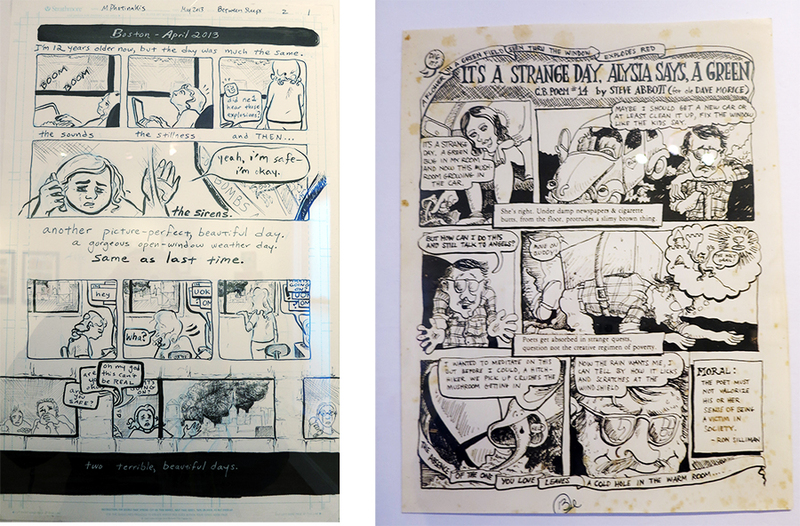 Cartoons such as these are labors of love, and it feels like an honor to see the original pages full size. Although I was left wanting a little more cohesion, “Doodle” shines in the moments where it draw the viewers in close to inspect fine line-work and fine story-telling. 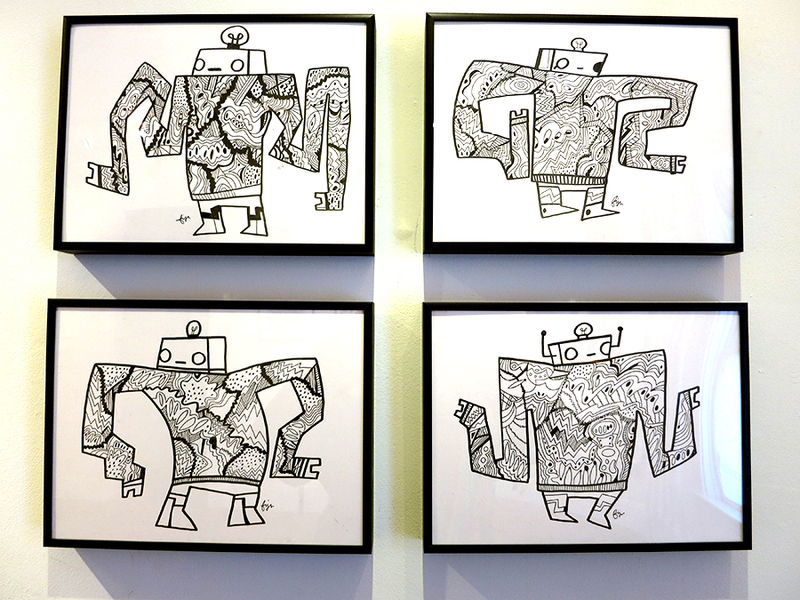 The Nave Gallery Annex is just outside Davis Square, take a moment to stop by enjoy some Doodles.